After weeks of suffering through giardia (a parasite), I am finally beginning to feel a bit better. Thank goodness, because I can’t imagine getting on a plane in this condition! Now that I’m beginning to come out of the fog, the nostalgia has set in. We were in a taxi last night and the driver asked if we live in Cuenca. This time we had to say, yes, but only for another week. That hurt. Suddenly, even the walk to the Latino Clinica for medical tests for the giardia brings back memories. It is right near the Tomebomba River, which always reminds me of fairy tales. The Tomebamba River in Cuenca. It is a rocky river with a lush green lawn. I am forever imagining how this river that flows through the middle of Cuenca was used by the indigenous people. Today, some even still use it to wash clothes. Most just sit on the banks and admire the flowing water and the beautiful flora. I get nostalgic thinking about our first few days here. We pass by Maria, who works in the “tienda” at the base of our building and I quickly recall our first chat with her and how Tony couldn’t say more than “gracias”…and how they are able to have a basic conversation in Spanish now. Time flies. One of the many beautiful churches in Cuenca. total in one city. I find myself photographing things that I’ve seen a million times. The light changes and it takes on a new beauty. It is more than the eyes can hold at times. Some of the children that I met volunteering. about them. I tear up thinking about how much I learned about the art of volunteering from them. The Ribbon Dance – a beautiful piece of artistry. 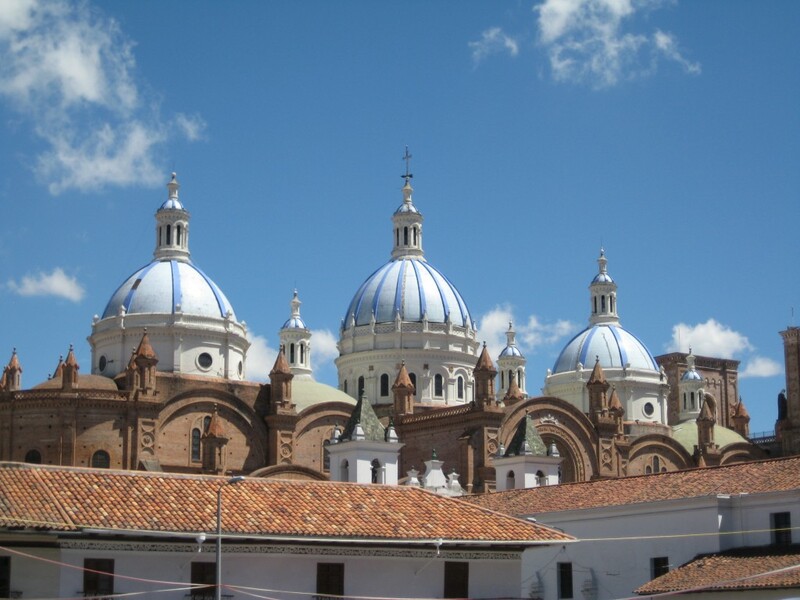 The blue domes of the “new” cathedral. You can see them from many places in the city. I’ll miss the holiday celebrations here. This is my husband being grabbed by a local man dressed as a woman on New Year’s Eve – as the “widow” of the New Year. They dress us and ask for some coins because they are now “widows” and need money. What a great memory! Our dinner table, feet from the beach. We met up with Ecuadorian friends from Quito and made some lifelong memories in “Las Tunas”. Conversations with the incredible owners of the pottery shop behind our apartment. This is the son of the founder. His father has been making pottery for 71 years! Beautiful artwork. It is everywhere. Friends we have made. Tony (my husband) and I met Giovanni at a festival behind our apartment building. The wonderful folks at El Nomad! Here I am with Rebecca Adams – and I got to hold her sleeping baby too…awwww! The precious children of this country. This little boy is from Paute, Ecuador. We met his dad, selling cotton candy, on the street. Nostaglia. It is definitely part of the re-entry rollercoaster. Note: I hope to soon write about my experience with our exercises from Beyond Abroad- Innovative Re-Entry Exercises. They have been very helpful in processing this part of the journey…and will continue to be once home too.